Playing a very good blocker is like playing a brick wall. Everything comes back. They seem to know where you’re going to attack even before you’ve played your shot. You put all the effort in, topspinning this way and that way, but the ball keeps being returned. By the end of the match you’re exhausted and dripping in sweat. You look across the table and your blocker opponent is as fresh as a daisy. What the heck? Blockers are not easy to beat. They use your own speed and spin against you. They can rush you. They can slow you down. They can move you all over the table. They disrupt your attacking flow and make it difficult to play continuous attacks. Not easy at all. So what can you do to beat a blocker? I have plenty of experience in this area. My team-mate and training partner, Yordan, is an excellent blocker, which has given me lots of practice against this playing style. I also block quite a lot when I’m coaching, so I know what is easy to block and what isn’t. A blocker will find it very easy if you always attack to the same position. I remember playing Yordan once and he stopped me half way through a match. He asked, ‘why do you always attack my forehand?’. I didn’t have an answer. I thought about it after the match. He was right. I did always attack his forehand. This was the position I was most comfortable attacking. But it was also very comfortable for Yordan. He knew where my topspin attack was going before I played my shot. I was predictable. He could move into position and block the ball anywhere he wanted. The next time we played, I attacked both his forehand and his backhand. Guess what? I had much more success. He didn’t know which side I was going to attack. It was harder for him to anticipate where the ball was going, which meant his blocks weren’t as effective. A blocker is usually very vulnerable to fast attacks aimed at their playing elbow. This is because they have to decide whether to block with their forehand or backhand. The speed of the attack is important. If the attack is too slow, the blocker will easily be able to move one way or another to block the ball back. If you attack with speed, the blocker has far less time to react. You will jam them up in the middle and force them to make an awkward block or outright error. Your point. I pinched this phrase from Mark Mitchell, a former England international who gives me coaching from time to time. Imagine placing a large bucket in the middle of your opponent’s forehand side of the table. And another bucket in the middle of their backhand side. These are the areas to avoid. Attacks where the ball bounces in the buckets are the easiest for a blocker to deal with. The ball comes onto their bat perfectly and they barely have to move to block the ball back. Easy peasey. Instead, attack deep or attack wide. Deep attacks will force a blocker backwards. Wide attacks will force a blocker to move sideways. 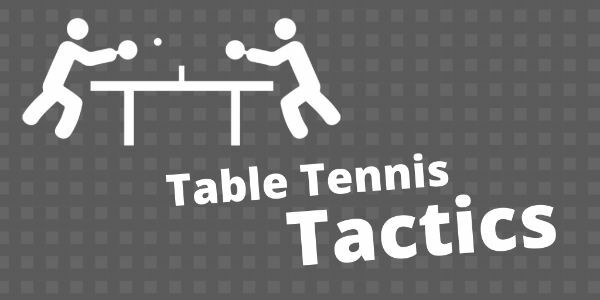 Basically, attack anywhere other than the buckets in the middle of the table. It is easier for a blocker if you always attack with the same speed and spin. They know what to expect. They can adjust their bat angle and then block, block, block, block. No problem. If you mix up the speed and spin of your attacks, they will find it much harder. You will force them to continually change their bat angle, timing and stroke length. I have often found that blockers are more comfortable with fast, spinny topspins, but can struggle with slow spinny topspins and flatter attacks. So try different things and keep them guessing. This is the number one mistake players make against blockers. They attack expecting to win the point and don’t recover quickly enough or don’t bother to recover at all. What happens? The ball is blocked back and the attacker is out of position to attack again. The attacker makes an error. Point to the blocker. No matter how good your attack, always expect the ball to come back. This means you need to recover quickly after each attack, so you are ready to attack again. If the ball isn’t returned, that’s a bonus. But you would have been ready anyway. It can be exhausting playing a good blocker. If you play to their strengths, it will feel like playing a brick wall. The ball will just keep coming back until you make a mistake. You have to play smart. Keep varying the position of your attacks. Attack the forehand. Attack the backhand. Attack their playing elbow. Don’t be predictable. Vary the speed and spin of your attacks. Try fast and spinny. Try slow and spinny. Try flatter attacks with less spin. Finally, make sure you recover quickly after every attack. You may have to play 3, 4, 5+ attacks to win the point. So attack, recover and get ready to attack again. What tactics do you use when playing a blocker? Let me know in the comments box below. Can you pass my consistency test? I play an irritating blocker almost everyday. Anything you return, he would reply with a chop. The only way to win a point against him is a sudden fast and long topspin, which is not easy to play against slow, short chops. 1. Blockers are usually not that strong at looping themselves. So, deep backspin serves and deep push returns are likely to give a next ball which is easier to attack. 2. Blockers usually stand close to the table and complement their blocks with a decent short game. Short serves or returns will likely meet a deep push into my elbow and if I can loop it at all, I’m playing into their block. So keeping it long from the start is usually a better idea. 3. When looping, placement is key. Blockers have good reaction speed and control, so power and spin are not really the way to go, as you’ve described. Varying the loops into the switching point, or outside the power pockets (buckets) is vital. I think I disagree that loops into the elbow need speed. I find that blockers are pretty good at handling even those, by holding up their racket in an awkward way, avoiding the choice. I find slow spinny loops into the elbow to be more effective: it requires more control and better timing. Thanks Dieter. Interesting comments about keeping the ball deep. I think this can work well if the blocker doesn’t attack much. It could be a bit more risky if the blocker can also loop a bit too. Just depends on the particular opponent.